When I heard about OPI Wooden Shoe Like to Know?, the first thing that came to mind was a joke from the musical, Mary Poppins. Do you remember the joke about a man with a wooden leg named Smith? (The awful punchline was: What was the name of his other leg?) Haha, it was really cheesy when I was a kid, but it still makes me smile now. 3 coats of OPI Wooden Shoe Like to Know? 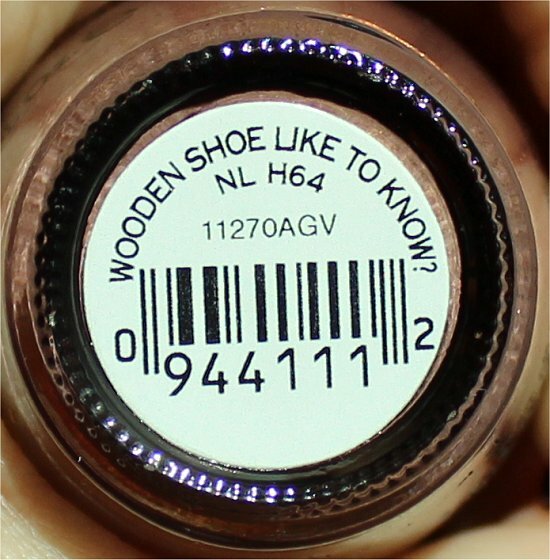 Name: OPI Wooden Shoe Like to Know? Wooden Shoe Like to Know? 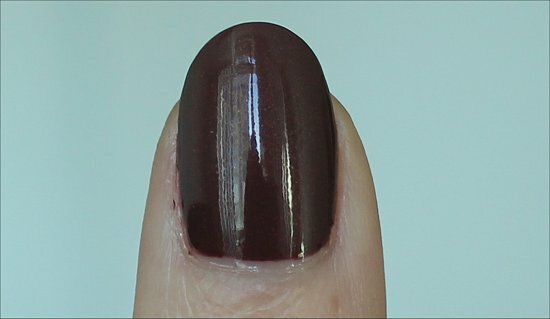 by OPI is a dusty brown that seems to have the slightest touch of purple. To the naked eye, it’s definitely a milk-chocolatey brown, but when I used the camera’s flash, that’s when the base colour gets exaggerated and I saw some purple. This is a shimmery nail polish. The shimmer is subtle, but you can see if when the light hits it just right. OPI Wooden Shoe Like to Know? has a runny formula, and I found that to achieve total opacity, I needed 3 coats. Because this polish is watery, I suggest using thinner coats than you normally would so that you can avoid flooding your cuticles. This isn’t the kind of colour that I’d normally gravitate toward, which is why I gave it a Final Verdict score that’s low. 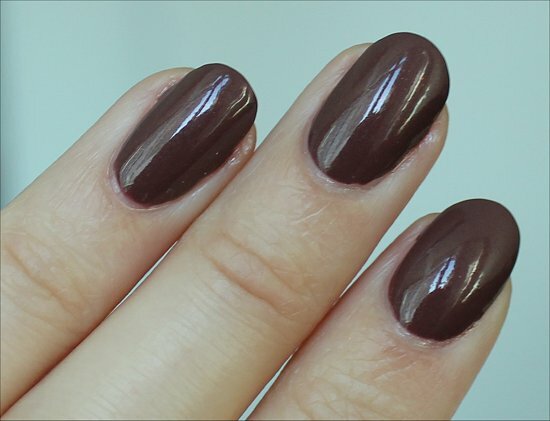 When I reach for a brown, I usually want it to be dark like OPI Espresso Your Style! I’ll definitely wear this again, but I need to be in the mood for a milk-chocolately brown. What’s your favourite kind of chocolate to eat? Do you wear brown nail polish? Have you ever worn wooden shoes? 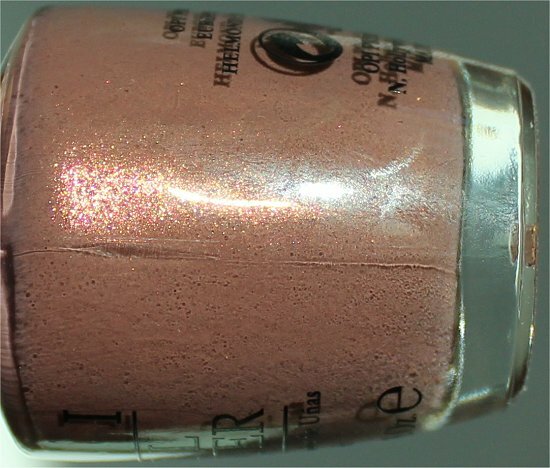 This entry was posted in Nail Polish Swatches & Reviews, Product Reviews and tagged OPI on February 11, 2012 by Mary S..
LOL…this is what I’m wearing right now. I was drawn to the shimmer, but you’re right. The light does have to be just right for it to really show a lot, but it’s enough to keep the color from looking blah. Mmmm chocolate sounds so good right now. I’d really like to just to go home right now and eat nutella out of the jar (or go back to sleep)! I’m not a huge fan of this colour, I think I already have one simliar to it by essie that I never wear. It looks yummy and cute in the bottle but not really to my taste when applied. Hee! Haha, I also got a kick out of when you said that it wasn’t to your TASTE! 😉 Clever pun! HAHAHA, the first time I wore a brown polish, I also thought that it might look like a poopicure. 😛 That might be why I don’t often wear many brown polishes. OMG This made me actually laugh out loud! 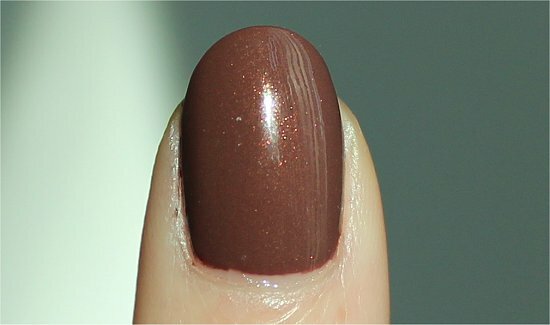 This is a lovely colour, the shimmer makes it extra nice and you’re right about it not being flat because of it. I had to laugh though because where I live, Whopper is the name of a type of burger, not a chocolate bar, and my first thought was EWW I don’t want burger nails!! Oh dear, lol! This isn’t my type of color, but it’s still pretty none the less! Just not something I’m going to run to the store for. It’s so hard to find the perfect brown polish. It’s hit or miss, and unless they have a lot of shimmer or are really vampy, they don’t usually call out to me, either. Not my type of polish color but I love OPI’s creative/funny names! I like the shimmer in this polish, I dont think I would like it much if it wasnt for that, it would be too “heavy” if that makes sense. Frosso recently posted: Super Freakin’ Awesome Giveaway! Now you have me craving chocolate Mary, lol! This is a really pretty color on you. I love the shimmer in it. Wish the formula was better though. I don’t wear brown too often, but when I do, I usually go for Aldo Chocolate Brown. It really looks like chocolate ;0). I would have to say one of my favorite chocolates is Cadbury. The one with the roasted almonds in it. So yummy!! Oh, and no, I’ve never wooden shoes. I don’t think they would be very comfortable, lol.